direct ticketing: Frankentipps.de starts online-ticketing with payment in real time. For the first time it’s now possible for buyers to order tickets on an event promoting web portal and to pay them in real time. By integrating leading online payment services Frankentipps.de, a ticketing portal from the Nuremberg Metropolitan Region, extends its self-developed process of direct ticketing. To be sure, paying tickets on the web via PayPal & Co. is nothing new. But normally tickets are paid at the ticketing portal, which then balances its accounts with the respective organizer. It is quite revolutionary, however, that the franconian event promoting web portal has consequently relied on directly linking ticket buyers and ticket sellers. 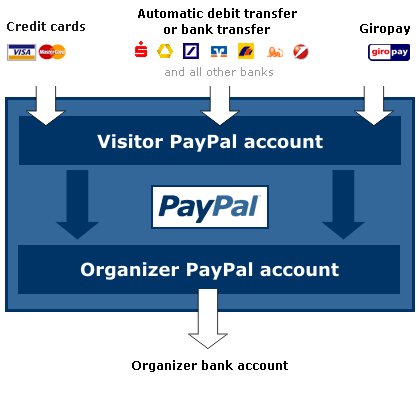 The interfaces of PayPal and sofortueberweisung.de allow the organizers to use their own accounts on these payment services during the ordering process as recipients of payments. All payments are transferred to the organizers’ accounts in real time. Even automated invoice creation and mailing is possible with the highly developed Frankentipps ticketing solution. This direct processing of orders on Frankentipps.de as a platform for companies keeps transaction costs for both sides extremely low. The result: Tickets as low-priced as possible, with low additional costs for the consumer, and hence an even more attractive online sales solution for organizers. The concept of direct marketing is particularly interesting in the low-price segment and for smaller cultural enterprises. To date online-ticketing has rarely been profitable in this segment due to high transaction costs. The restaurant ELEMENTS in Erlangen perfectly demonstrates the value added of direct ticketing. This year’s Altweiberfasching, a carnival party, is the first event on Frankentipps.de featuring the direct payment via PayPal. “Our guests appreciate the service of buying tickets for events in ELEMENTS online. Says Gunther Beckert, owner of the restaurant: “We are happy to pass on to our customers the advantage of extremely low marketing costs on Frankentipps.de”. Box office 12 Euro, online pre-selling 10 Euro! wolfrum.de, a web and media company from Erlangen, develops and distributes since 1998 internet-based applications, online marketing instruments and internet portal concepts. In mid 2005 – on the day the founding declaration of Nuremberg Metropolitan Region was made public – the internet service company started the self developed event promotion portal Frankentipps.de. To strengthen online networking capabilities of cultural enterprises within the region and worldwide was one basic idea of this portal. Moreover, it is a primary goal of Frankentipps.de to allow smaller organizers to benefit from the fantastic possibilities the internet provides by using them in a professional way. Frankentipps.de is with over 1500 registered organizers and yearly 4.5 million visitors one of the biggest regional portals of that kind in Germany. PayPal is the faster, safer way to pay and get paid online. The service allows members to send money without sharing financial information, with the flexibility to pay using their account balances, bank accounts, credit cards or promotional financing. With more than 87 million active accounts in 190 markets and 24 currencies around the world, PayPal enables global ecommerce. PayPal is an eBay company and is made up of three leading online payment services: the PayPal global payment service, the Payflow Gateway and Bill Me Later. The company’s open payment platform, PayPal X, allows developers to build innovative payment applications on multiple platforms and devices. More information about the company can be found at PayPal.com. sofortuberweisung.de is the german language market version of DIRECTebanking.com. DIRECTebanking.com is the direct payment method of Payment Network AG. DIRECTebanking.com allows you to directly and automatically trigger a credit transfer during your online purchase with your online banking information. A transfer order is instantly confirmed to merchant allowing an instant delivery of goods and services. DIRECTebanking.com has been certified by the largest German quality and security institute, the TÜV, according to best-practice data privacy standards. There is no need for an additional registration or a credit card. It works simply, secure and fast with your online banking account. Vorheriger Beitrag:direct ticketing: Frankentipps.de veröffentlicht Online-Ticketing mit Echtzeit-Bezahlfunktion.